LTL is an accredited Chinese language school in China, and as such we are authorised to issue invitations for Shanghai Student Visas to all full time language students. We will provide you with the required invitation letters, confirmation of accommodation and other documents, as well as advice on how and where to apply. Chinese visas for Shanghai can seem quite complex – and the information provided by embassies is often inconsistent and not very helpful – but we have invited thousands of students to come to China from pretty much every country on this planet and we know how the process works. Your Student Advisor will be able to advise you on how to fill out your application form and do the other formalities. For many countries Chinese embassies will accept electronic copies of the invitation documents for your application and we can easily email them to you within a day of you having made the booking or even faster. Some Chinese embassies however might require originals, which we can of course send to you via DHL. Depending on where you live this will take two to five days and cost between 400 and 700 CNY, so please make sure you leave yourself enough time. As a fully accredited language school, LTL is in full compliance with Chinese visa and residence permit regulations for foreigners in Shanghai. We fully cover the costs of these for all students who require a visa for up to 90 days and only take a 1,200 CNY contribution for anyone staying longer than that. Unless you specifically ask us to do otherwise, we will always send you the electronic copies of your Chinese visa documents first so you can apply with them and save yourself the DHL courier charges. If you want your visa to be valid a bit longer than your course to travel around China, it is possible to organize this. If you want to stay in China much longer than your course or do not know yet how long you want to study Chinese for and need a visa, please email us at [email protected] with your questions as the guidelines for this are quite complex and vary depending on your nationality and we will get back to you within less than a working day. This depends on your nationality and the country you live in. Many – but not all – embassies only allow citizens or registered residents of the country they are located in to apply. Sometimes it is also possible to simply send your passport and application documents to an embassy in your home country, without you actually having to travel there. In some countries the application has to be handed in directly at the Chinese embassy, while in others they require you to go through a visa processing office that pre-screens applications. Send us an email at [email protected] with your nationality and current residence and we will let you know where to best apply. How much the embassy will charge you for your visa application will depend on your nationality and the duration of the visa you apply for. Some embassies – but not all – also offer express services that are faster, but cost a bit more. This very much depends on which embassy you apply at. We have seen anything from 24 hour express services to several weeks’ waiting time. If there are Chinese holidays or the visa centre has any questions it might take longer. In general with everything in China always the earlier the better, because there is always a certain amount of unpredictability with any kind of visa rules and processes. For peace of mind, we recommend to apply for your visa about two months before your planned arrival date. In very last minute situations, we have had students secure visas within just a few days before departure, however as this can be quite stressful (for you and for us) we recommend to avoid situations like this whenever possible. Generally you won’t be interviewed. There are rare occasions when this is required but it’s not something you should worry about. How long can the visas be valid for? Normal student visa invitations are issued for up to 180 days, however it is also possible to stay longer. Please email us at [email protected] with your exact travel details and we will let you know. Should I apply directly or via an agency? Visa agencies charge money for their services so going yourself is always the cheapest option. However, a good visa agency (not all are good – please check with your student advisor regarding recent recommendations from other LTL students) not only saves you time and the need to queue at the embassy yourself – they also check your visa application before it is handed in and can inform you about any current specific requirements the embassy might have. As it is usually the little details that are not properly published on the internet, like a wrongly filled out form or applying at the wrong embassy, that lead to problems and delays, applying via an experienced and reliable Chinese visa agency might end up saving you not only time, but also hassle. Can I get a multiple entry visa? If you let us know in advance we can issue you a multiple entry visa invitation and you can apply for a multiple entry student visa. However, how many entries will actually be granted is decided upon by the visa officer. Is the visa valid for other cities too? Yes, with your visa for a Chinese language course in Shanghai, you can move freely anywhere inside China. With the Multi City or Immersion Programs, it is also possible to study in several Chinese cities with the same visa. 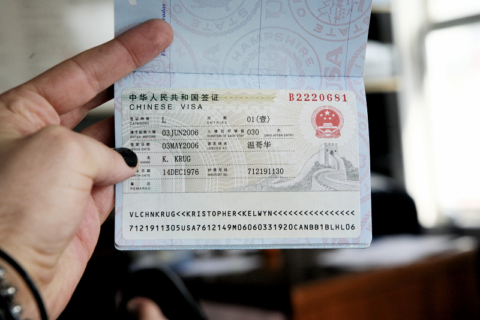 Can I extend my visa in Shanghai? With a valid visa invitation from an accredited language school, it is possible to apply for a visa extension at the Public Security Bureau in Shanghai. Whether an extension is granted however is decided upon by the visa officer. As anything happening in the Chinese bureaucracy can be a bit unpredictable, we recommend you to decide upon the length of your stay in China before you come to Shanghai and apply for a visa for the full duration at the beginning. Which Chinese embassies require original invitation documents? The way this is handled keeps changing all the time and there is no set rule for this. Procedures can change from applicant to applicant or even vary between different embassies in the same country. Currently, for example, we are told that Chinese consulates the UK, Germany, New York and Japan do not require originals for student visa applications, while those in Italy, Spain, Indonesia and Texas do. The best way to find out is by asking your student advisor regarding recent experiences of other LTL students who applied for a student visa in the consulate you are planning to apply. In some cases it might also be a good choice to not apply in the consulate closest to you, but the one that currently has the easiest application procedures. Your student advisor can help you there. The full name of the receiving person, your address including post code and a phone number the courier can call when delivering the visa documents to you. We can pre-pay the DHL fees for you and you can pay them with your invoice together or if you already made full payment in cash at our school when you are in Beijing/Shanghai. As a standard procedure, we issue visa invitations documents within one working day of the booking of a course. While we are available for emergency help with last minute changes or questions from the embassy, we very strongly appreciate if you leave yourself plenty of time with the visa application to avoid us having to issue invitations on weekends, call embassies in the middle of the night China time or the like.